I wonder: there are dents and then there are distortions, all the trickier in a movie that is entertaining and suspenseful in old-fashioned ways. Indeed, it’s a picture that might have been made in 1979-80, or earlier. But Bowden deserves to be listened to: he tells stories about American courage under pressure (like Black Hawk Down), where the political decision that demanded sacrifice may have been misguided. He also wrote a book, Guests of the Ayatollah, on the hostage crisis. Still, this is a movie about Iran, a country that is now a carefully contrived crisis of mythic proportion. The movie is well made; it has a hero (played by the director Ben Affleck) who is casually gorgeous, cool and laconic; the other people—the white people, at least—are odd and likeable and tense with anxiety; and the film earned $40 million in its first ten days. Some people have suggested it could be Best Picture material. That is absurd and dangerously close to our easy acceptance of the way the population of Iran is depicted as a howling mob, such as we might have seen in The Four Feathers or Gunga Din, or any of those movies that regard the peoples east of Suez as crazed and dangerous extras. So, in a way, this is a remake of Casablanca (70 years old this year) where the good guys make their escape, despite the unshaded malice of Colonel Strasser and the Nazis. “Tony Mendez” the hero looks as good as Ben Affleck has ever managed in long hair, a beard and a tweed jacket—he’s a brother to the Warren Beatty of the early ’70s (The Parallax View crossed with McCabe and Mrs. Miller). He is the C.I.A. agent who goes into Tehran to retrieve the six under the cover story that they are Canadians making a stupid fantasy movie, Argo. There was such a man, but he was Hispanic—a detail Affleck does not attempt to match. That’s a clue to the way “based on a real story” is deftly turned into an effective son of Casablanca. The conclusion has the vital plane to Zurich pursued down the Tehran runway by irate police cars and trucks of troops. Did it happen that way? It’s not how the six remember it. If the Iranian authorities had been so ruthless and omniscient all they had to do was call the air traffic control tower and forbid the take-off. But that would spoil Affleck’s set-piece finish and the exuberant tribute to Hollywood panache. It’s most entertaining scenes are set in Los Angeles and they involve John Goodman and Alan Arkin as veteran cynics who conspire in the Argo nonsense—with trade press stories, posters, a script and storyboards, and an office phone if airport security decided to check it out. These guys immediately understand the notion of a fake film—so many of their projects have been like that—and there are moments worthy of Billy Wilder. It’s likely to get a supporting actor nomination for Arkin, who has gone from being the star of movies no one would buy to a geezer who steals every picture he’s in. No wonder we’re laughing so much; no wonder we’re holding onto each other in suspense as the escapees make their slow way through airport security. But what worked with Casablanca in 1942 required an innocence in the audience and a faith in America that is far-fetched today. This is Iran persuading us that an American disaster had its bright side and ripping yarns. But Iran has been a disaster in ways that exceed Netanyahu’s anxiety. Argo opens oddly, with newsreel footage and a plaintive female voice recounting the country’s recent history—of how in the early ’50s Mohammed Mossadeq was elected as prime minister in a country ruled by the Pahlavi family and its Shahs. Mossadeq is still a revered figure in Iran, because of his social reforms and his attempt to nationalize an oil industry controlled by Britain. The British were so angered by this that Churchill and Eisenhower initiated a 1953 coup carried out by the C.I.A. (led by Allen Dulles, brother to the Secretary of State, John Foster Dulles). That success surely inspired the action in Suez a few years later, when British-French-Israeli collusion was stopped by a chastened Eisenhower. So the Shah regained authority and returned to deals with the West, to abuse of his own people, and the denial of reforms. This Shah was depicted in the Western media as an urbane, handsome “white” Iranian with fine manners and glamorous wives. Ultimately, his regime was ousted by revolution and the return to Iran of the exiled Ayatollah. A few months later, the embassy workers were made hostages. And that was a very bad and unkind action, even if all the hostages survived. 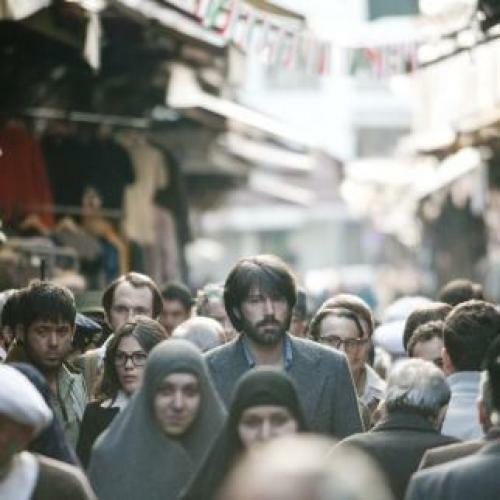 But it’s about time we honored the complexity of Iran and the justice of many of its attitudes, and Argo is a flagrant attempt to restore old enmities and the cliché of the Iranian street and its crowd in the name of making an astute but hokey thriller. So, it’s a hit made in the spirit that launched the C.I.A. coup in 1953 (“Operation Ajax,” another version of “Argo”). That is part of the propaganda that describes Iran as a theocratic menace and a source for terrorism. Argo hears no saner voices from Iran. There is a maid in the Canadian embassy and the paranoia of the suspense plot fears she is passing information to the authorities, whereas it turns out she is on the side of the hostages. That’s welcome, but she never has an opportunity to say why. Cinephiles know that Iran is a complicated country that has produced A Separation (one of the great films of recent years) and a body of wise questioning, humane directors such as Abbas Kiarostami. I think he would be saddened to see Argo and the lost opportunity and the assured way in which misunderstanding is accelerating. Argo dazzles, but it’s less than brilliant.